� In Chicago 2009 Kessy and Ross became just the sixth team worldwide to surpass the $1 million mark in career earnings as a partnership. � From October 2008 through the 2010 Moscow Grand Slam, Kessy and Ross played for a medal in 17 of their 20 FIVB events (winning seven golds, six silvers, three bronzes in that span). � Kessy surpassed $1 million in career earnings in Gstaad in 2010, becoming the eighth woman (and sixth American) to do so. � On the AVP, Kessy and Ross lost their first nine title matches, but ended by winning nine straight before the 2013 St. Petersburg championship (which was never played). � Kessy has been in at least one AVP championship match each season since 2004 (she did not play in AVP in 2011 and she missed 2014 due to pregnancy). � Entering the 2016 season, in her 45 AVP tournaments since the start of 2008, Kessy has won 15 times, placed second 12 times, and finished third 13 times (just five finishes eliminated before the semifinals). 2015: Kessy formed a partnership with Emily Day, and they advanced to the championship match in each of their first two AVP events, winning once. On the year, they played in four semifinals in seven tournaments. Kessy was fourth on the Tour in aces per set (.90), seventh in hitting percentage (.440) and 10th in kills per set (6.54). Kessy and Day played in 11 FIVB events, with a best of fifth. 2014: Did not compete as she gave birth to her first daughter during the summer. 2013: Kessy and Ross played in five AVP tournaments, advancing to the semifinals each time. They won twice, and in their last AVP event together advanced to the title match in St. Petersburg, Fla., but it was never played due to weather. 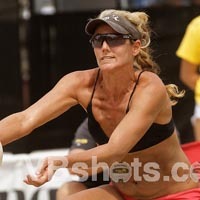 Kessy played the final AVP event of the year with Rachel Scott. Kessy and Ross played seven FIVB tournaments together, with two semifinals and a best of second place. Kessy ended the international season playing one event with Brooke Sweat and one with Whitney Pavlik, winning a bronze medal. 2012: In the first seven FIVB events, the duo had a best of third once. In the 2012 London Olympics, Kessy and Ross won a silver medal. The pair ended the season with a win in Thailand, and again finished fourth in terms of season points. In three domestic events on two different tours, they won all three times. 2011: In the FIVB season opener in Brasilia, Kessy and Ross overcame a first-round loss to win a bronze medal, while in Shanghai the duo rebounded from a second-round loss to win a silver medal. They played in the test event in London in preparation for the 2012 Olympics, placing second. In the World Championships in Rome, Kessy and Ross placed fifth. For the year, the duo advanced to the semifinals in 7 of their 14 events, winning a medal each time including gold in the Stavanger Grand Slam. Kessy and Ross ended as the fourth-ranked team on the FIVB Tour. Domestically, they played in four events on three different tours, winning twice. 2010: Kessy and Ross began the AVP season with a third and then a fifth in Santa Barbara, ending a streak of 21 straight AVP events advancing to the semifinals. They then won the next four domestic events, and the victory in Huntington Beach gave Kessy her first career title in Southern California. Kessy and Ross completed the AVP season with a 31-4 record, having won 24 of their last 25 matches. The duo played for a medal in each of the first five FIVB events, extending their streak to eight straight FIVB events playing for a medal, and collected two wins, before placing ninth in Stavanger. They failed to win a medal in eight straight events leading up to Sanya, where they placed third. 2009: Kessy and Ross appeared in the finals of nine of their 10 regular season AVP events, winning four times. Their win in Houston marked their first AVP title together after going 0-9 in title matches domestically. In Mason the duo extended their streak to 19 consecutive semifinals on the AVP. Kessy won the individual event on the AVP Tour for the second consecutive season. Kessy ended the year third in hitting percentage (.483) and sixth in kills per game (6.98). On the FIVB Tour the duo won the World Championships in Stavanger, Norway, marking the fourth straight time a team from the USA has won that title. In Gstaad the pair finished fifth, ending a streak of 20 consecutive tournaments (AVP and FIVB) in the semifinals and six straight FIVB gold medal match appearances. Kessy and Ross also won in Marseille as well as the season finale in Phuket, increasing their total to nine medals earned in 12 events during the season. 2008: Kessy and Ross were in the semifinals in all but one AVP event, including five championship matches, ending as the third-ranked team on Tour. In the season-ending Best of the Beach competition, Kessy won her first title in the individual format tournament, playing with Kerri Walsh in the finals. That tournament pushed her into the top 10 in domestic earnings all-time. Internationally, Kessy and Ross just missed qualifying for the Beijing Olympics, finishing seventh in the world rankings but as the third American team. Kessy and Ross ended the FIVB season with a second place finish followed by victories on consecutive weekends. 2007: Kicked off her new partnership with April Ross with a second-place finish in the season opener in Miami. The pair advanced to five additional semifinals, including another championship match. In Hermosa Beach they defeated Misty May-Treanor and Kerri Walsh in the winner's bracket, marking just the third time that duo had lost on the AVP Tour prior to the semifinals. On the FIVB Tour, their first event ended with a loss in the country qualifier. The next week, in the Stavanger Grand Slam, they became the lowest seeded team (29th) to win an FIVB event. After winning their country quota match and a pair of qualifier matches, they overcame two early pool play losses and won six straight matches to capture the title. 2006: Played for the first time with Nancy Mason domestically, and the duo reached the championship match in their first two events. In the next eight events they advanced to the semifinals three times, and Kessy teamed with Rachel Wacholder for the remainder of the season. In five tournaments with Wacholder, they had four semifinal appearances including two finals. Kessy ended sixth in hitting percentage (.438) and eighth in blocks per game (.81). Internationally, Kessy had a best of 13th in eight events with the two different partners. 2005: Began playing with Holly McPeak, and the duo reached the semifinals in 11 of 13 events including two championship matches, ending as the third-ranked team on the AVP Tour. In the Goddess of the Beach event, Kessy was chosen by Rachel Wacholder as a partner in the finals. Kessy ended the year ranked second on the Tour in blocks per game (1.03). Internationally, Kessy and McPeak played in four events, with a best of seventh in the Klagenfurt Grand Slam despite suffering a first-round defeat. Kessy and Nancy Mason competed four times on the FIVB Tour, with three fifth-place finishes and a semifinal appearance in Acapulco after advancing from the qualifier. 2004: Playing with Fontana, Kessy advanced to four semifinals, including her first championship match (in Huntington Beach). Additionally, her five fifth-place finishes helped her to a top-10 ranking and the Most Improved Player award. Ranked third on the Tour in blocks per game (.99). 2003: Played most of the season with Jenny Pavley before partnering with Barbra Fontana. In seven events, she finished lower than her previous career best, ninth, just once. On the year she lost just one match to a team seeded lower, while logging three upset victories en route to her first top 20 season in terms of points. 2002: Equaled her career best of ninth domestically two times in six AVP events. 2001: Again played five domestic events, with three ninths, and twice played overseas, winning an FIVB Challenger event in Thailand with Heather Lowe. 2000: Began her pro beach career with five domestic events, with a best of ninth, and three international tournaments. � In the 2012 London Olympics Kess qualified with April Ross as the fourth-seeded team. The duo went undefeated in pool play, then won three matches to reach the finals, losing to Misty May-Treanor and Kerri Walsh in winning the Silver Medal. College: Kessy graduated from USC with a degree in history and was a member of the volleyball team for all four years (1995-1998). She was named All-District in 1997, All-American in 1998 and earned All-PAC 10 selection 1995-1998. Kessy was also a member of the U.S. Junior National Team. She played indoors professionally for the Chicago Thunder in 2002 and in Puerto Rico in 2003. Personal: Kessy was born and raised in Orange County alongside her brothers Ryan and Travis. In March 2013 she married French pro beach volleyball player Andy Ces and in August 2014 they had a daughter, Aila Anne.